Spacemen 3 founder Pete "Sonic Boom" Kember is currently undertaking a tour of the UK. I've yet to find any reviews of the other gigs, but I'd be interested to hear how the rest of the tour is going. I'd like to think that the shambolic mess I witnessed on Friday night was a one-off but I fear that may not be the case. The first question that enters my mind as Sonic wanders onto the stage is "Does he ever age? "; his hair is shorter than I remember but he looks more like a gawky teenager than ever. I then start to wonder whether the show will ever start, as it's almost 11pm and he has already spent an inordinate amount of time setting up his keyboards. After what seems like an eternity of dithering, we are finally treated to a set made up almost entirely of Spacemen 3 songs, or cover versions that used to feature in the Spacemen live set, such as "When Tomorrow Hits" and "Transparent Radiation". The only "new" song is "How You Satisfy Me", which is possibly Sonic's best post-Spacemen effort, but even that is 17 years old. From a nostalgic viewpoint, it's great to hear these songs played live, "Transparent Radiation" in particular, as Spacemen 3 were a permanent fixture on my turntable during my student days. But it's also apparent that Sonic relies too heavily on his old material, and he should maybe take some time out to write new songs. It's obvious why, in the post-Spacemen wars, Spiritualized are more popular. Jason Pierce may include one or two Spacemen songs in his live set but he could never be accused of living off past glories and has produced a large amount of quality material of his own since his infamous break-up with Sonic Boom during the recording of "Recurring". 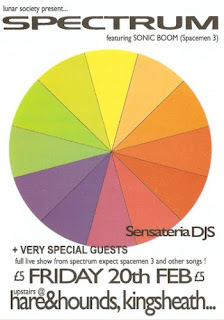 I would have been prepared to forgive the unbalanced setlist, and probably even been excited to hear all those Spacemen 3 songs, if Sonic had noticed that there was a crowd there to see him, rather than just treating the gig like a rehearsal. He has become obsessed with quality control in a way that Kevin Shields could only dream of, and is constantly wandering around the stage tweaking the equipment. Perhaps the most irritating thing he does is to address the soundman over the microphone mid-song whenever he wants the bass turned up or down. This is not something I expect from someone who has been performing for over 20 years. The rest of band look embarrassed by his onstage behaviour. As the set progresses, the gaps between the songs become longer than the songs themselves. Half the crowd have left already and Sonic has lost the attention of the ones who remain; they are now just chatting amongst themselves, uncertain whether he is actually going to play another song. After "Revolution", I decide to call it a night rather than risk missing the last bus. I don't like leaving a gig before the end but in this case Sonic was doing nothing to convince me I should stay. Maybe he played for another hour after I left and included some new songs, but I'm guessing that by this stage he was almost out of time anyway. I hate to sound so negative about someone I once admired, but this could easily have been a very enjoyable gig if Sonic had been more relaxed about the finer points of the sound and had just let things happen naturally. I guess Sonic no longer knows or cares what Jason is doing, but maybe he needs to watch a Spiritualized gig to see how it should be done. Jeez. Glad I missed it.